I admire those crazy spider types who can run, jump and scale buildings with just a couple of hops. It reminds me of how much I wanted to be Spider-Man when I was a kid. They say it's never too late to learn something new, but I'm sure if I tried the kind of stuff in the video below, it would look like THIS. Anywho... this is a cool, first person video of a parkour enthusiast trying to outrun zombies who are just as good at it as he is. It was inspired by the new video game, Dying Light. All I can say is, if zombies can keep up with this guy, the rest of us are screwed. You guys know I love zombie films, right? I've mentioned that before, yes? Did you know they make great training films for all the new recruits here at B'HQ? For example, we wouldn't have the state-of-the-art lawnmower chest plate with out that awesome scene from "Dead Alive," AND each guard marching the perimeter is issued both a firearm AND cricket bat thanks to "Shaun of the Dead." That's why we're all giggly over the trailer to the Australian zombie flick, "Wyrmwood: Road of the Dead." Described as "Mad Max" meets "Dawn of the Dead," it sounds like a plethora of body armor/weaponry information and ideas. According to it's official IMDB page, it releases to theaters February 13th... just in time for Valentine's Day, so grab your sweetie, some ammo, and possibly a barf bag because this looks ridiculously cool. I love birthdays.... not mine so much. At my age there's nothing much to celebrate except that you're not dead yet.... but in general, birthdays are cool. There's cake, ice cream, naked pin the tail on the donkey... what's not to love? I also love AMC's "The Walking Dead." So imagine how excited I am to shout out a happy bday to two of our favorite walker-slayers! Yesterday was the anniversary of the birth of Norman Reedus... the one and only guy who brings recovering bigot Daryl Dixon to life. And TODAY is the birthday of everyone's favorite tv farm girl, Lauren Cohan, aka Maggie! There were no party invites in my mailbox or voicemail, so I'm assuming they celebrated alone with a quart of ice cream and their old Journey albums, like I do. Aim high. Run fast. February 8th. Holy crap it's a new year. Each January, people around the world make resolutions to "improve" their employment status, their education, or themselves. Unfortunately, in their quest for something new, they often disregard tried and true standards... standards that could keep them safe when granny comes shuffling home again. One of those tried and true standards is none other than the B'hold Designs Ultimate Camouflage! What makes it so "ultimate" you ask? Consider regular camouflage. It helps you hide. Big deal... so you're hiding behind a bush and STILL can't make your way thru the undead to what's left of the 7-11 across the street. BUT, with the patented messaging on the B'hold Designs ULTIMATE Camouflage, it doesn't matter if you're seen or not! Stroll across the street with confidence as zombie after zombie reads your shirt, shrugs and shuffles away, forced to search elsewhere to satisfy their brain lust. Finally, you have time to grab that Big Gulp... hell, grab TWO if you want. That's right. It's as simple as that. That magical link will take you directly to my storefront, where my army of trained monkeys will assist you with your purchase. Know anyone else that you'd like to see survive the apocalypse? Don't be afraid to get them a shirt while you're at it... or an iPad case, or phone case, or a coffee mug, travel mug or a freakin' throw pillow (you heard me). 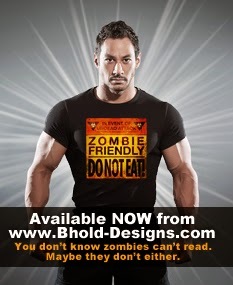 At B'hold Designs, your safety when the zombies come is our main concern, but we want money too, so click and buy stuff, because at B'hold Designs, we put the "AWESOME" in "Holy crap! That's AWESOME!" 2014 is drawing to a close. All too soon it will be a new year, with new possibilities, resolutions and crazy long lines for the dumbbell rack in the gym. Next year the four-eyed whiz-bangs at B'HQ will be upgrading the old zombification machine with whistles and fancy new knobs! And, if budget allows, one of those cool electo-spheres that makes your hair stand up when you touch it! BUT - before I could initiate machine upgrade protocol (clean it), along came our pals Holly and Tony in from Long Beach! Why? To use our phone volunteer to be zombified, of course! So, check it out, boys and girls... the final zombies from B'hold Designs for 2014! And while you're at it, head over to the official B'HQ Zombie Horde to check out others you may have missed (and be sure to exit thru the gift shop). Aim high. Run fast. Happy New Year! I don't know a lot about these "Hunger Games" movies, nor have I read the books so I can't really reflect on the storyline and how it may or may not apply to a possible zombie apocalypse. 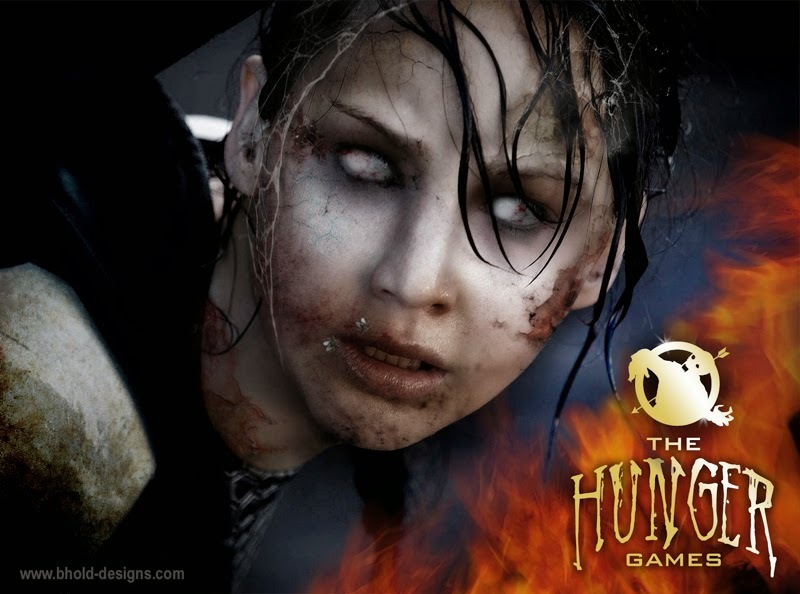 I have, however, always felt that "The Hunger Games" sounds more like the title of a zombie movie than anything else, and having seen a few interviews with Jennifer Lawrence, I can't help but think she'd be totally down for starring in such a film! So, Jen, if you're reading this (and really, why wouldn't you be? ), give me a shout. I've got a few dozen scripts gathering dust in the basement of B'HQ I'd like to run past you. In the meantime... enjoy the TRUE "Hunger Games." A New Breed of Zombie? I don't discuss video game zombies very often, simply because I'm not a gamer and therefore don't feel qualified to judge various attempts at apocalyptic zombie horror in that context. HOWEVER, I want to share this trailer for the zombies of "Call of Duty: Advanced Warfare" simply because of the names that are attached to it....and also the amazing graphics. It's narrated by John Malkovich, who provides his talents to the game along with a few others you may know - Rose McGowan, Bill Paxton ("Game over, man! Game over!! "...it's a movie reference kiddos. Look it up.) and "The Walking Dead's" own, Mr. Jon Bernthal (Shane)! 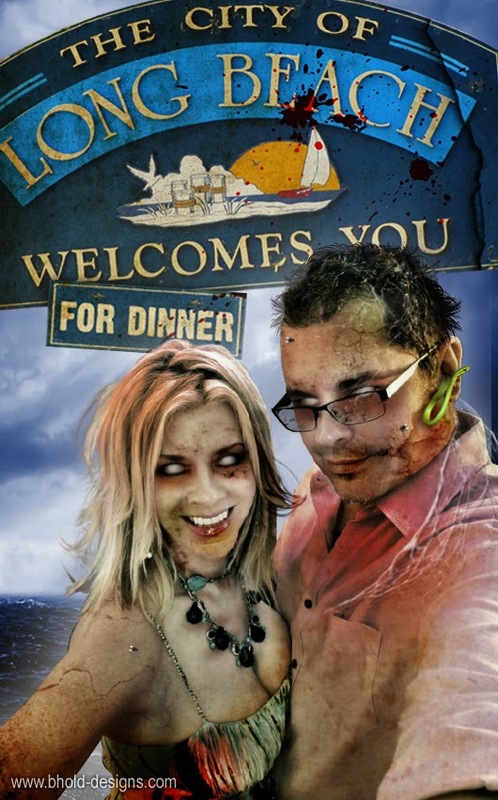 The thoughts and ramblings of a zombie-obsessed graphic designer.